Electroplated gold coating has excellent and consistent reflectivity in the infrared and good reflectivity in the visible, which allows the easy use of visible alignment lasers. Unlike vacuum deposited gold coatings, our electroplated gold never peels, flakes or delaminates. 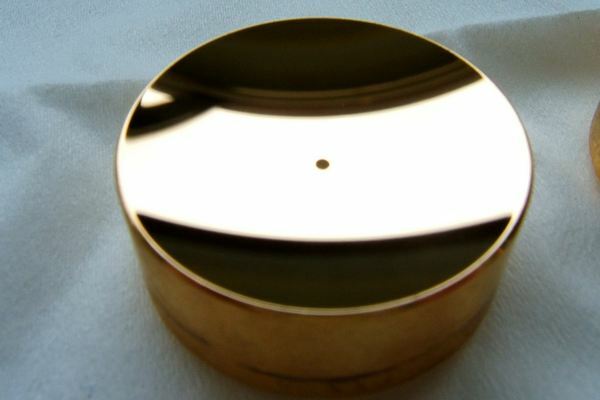 Polarisation changes to the laser beam on reflection are virtually zero, so for metal cutting and other polarisation sensitive applications, gold mirrors are the most reliable way of maintaining polarisation. Because reflectivity is almost independent of angle of incidence, gold is an excellent choice of coating for scanner mirrors or for mirrors used at varying angles of incidence - collimator mirrors for example. 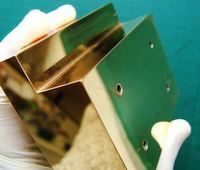 Electroplated gold coating is in intimate thermal contact with the mirror substrate so localised burns, dust and scratches have little effect on the mirror’s performance - ideal for high power carbon dioxide laser cutting. Electroplated gold is widely used with Er:YAG lasers, CO2 lasers, QCLs, OPOs and many other applications in the infrared from 1-300 microns wavelength, including terahertz imaging. Our gold coating covers all the mirror surfaces - front sides and rear - so there are no discontinuities that can initiate delamination of the coating. Cassegrain reflectors and Herriott cells use our gold coated metal mirrors because the through holes in the mirror are also gold coated. The coating will withstand typical medical sterilisation procedures. 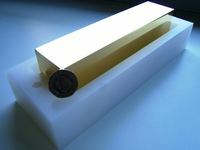 Chemically deposited gold coating has a huge laser damage threshold. With a copper mirror substrate, gold coated mirrors will withstand 40 KiloWatts - see laser damage resistance of CO2 laser optics. Gold mirrors need careful cleaning, see our technical documents on the subject of cleaning laser mirrors and contamination. 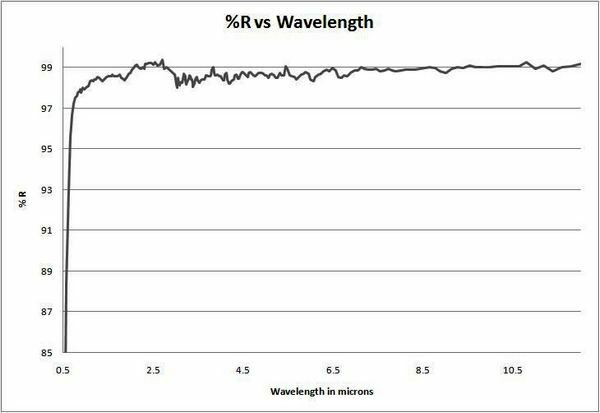 There is a strong technical and economic case for using gold mirrors as beam delivery optics. A survey of used MaxR coated mirrors from different suppliers has shown that most mirrors after just a short time of use, even if 99.8% reflective when new, are typically 98% reflective in operation.